V.com weekend vote: When you buy new recorded music, in what format do you prefer to buy it, CD or digital download? The world's a-changin' and that means that we often get our music in different ways than before. 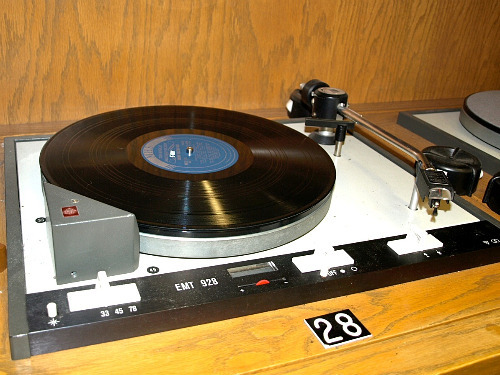 Yes, I am old enough that I owned vinyl records, cassettes, and there were even a few eight-track tapes in the house. Last summer, I visited the listening library at Northwestern University -- a beautiful place where I had a work-study job for four years while getting my music degree. I loved being near all those recordings: stacks and stacks of vinyl, rows of CDs, boxes of reel-to-reel tapes, even some cassettes. Imagine, a library that's a temple to recorded sound and to the storage thereof. It smells a certain way, feels a certain way. But do we even need such a thing any more? Stacks and stacks of vinyl, baby. I love a big vinyl record, and I love that it comes in a huge cardboard sleeve that just begs to be covered with art and story. CDs can be a smaller version of the same, with booklets inside, or foldouts with photos and art and words. I like being able to hold such things in my hand. At the same time, what could be more convenient than being able to store a week's worth of recorded sound in a gizmo that fits in the palm of your hand? These days, I'm not even sure if it's possible to buy new recorded vinyl, especially classical music. The main options are CD or digital download. What are your thoughts on the matter? And if you were to buy some new recorded music today, in what form would you buy it, CD or digital download? CD -- digital downloads can have all sorts of annoying problems and weird copyright junk on them that allows you to play them on one platform but not another. Hard drive failures can wipe out an entire music library. And I have no doubt that someone somewhere is trying to get digital music to "expire" and refuse to play after a certain period of time, forcing one to re-purchase what one has already purchased. With a CD, you rip it and always have a physical copy someplace. Someday, I suppose the medium and method of storage will go away to the point where ripping won't be a possibility, but until then, I want a physical object that I have purchased with the information on it, just as insurance. And CDs are a better medium than vinyl since the method of harvested the data off of the thing doesn't damage it quite so much. That's the biggest problem with vinyl -- the very means of harvesting the information off of the medium damages it. In a theoretical world free of dust and static, vinyl is better. In the real world we live in, digital is practically better. The codecs can stand a lot of improvement, though -- FLAC files blow most everything else out of the water, especially mp3s, the processing for which eats things like echo and reverb alive. The lushness of uncompressed audio can blow the pants off of an mp3. good as they are, now everyone gets to play and you can wind up with a lot of junk and a surprising amount of incredible amateur work. I guess I'm kind of in-between. I prefer "lossless" digital audio, but I also like the idea of a physical object that is mine that can't be killed by a drive failure or bizarre control software. I prefer to buy CD's but, I will take a download! I prefer CD over digital download, because I can always listen to the CD, and rip to mp3 at the quality settings I desire. If, I lose my mp3 or it becomes corrupted, I still have the CD. I prefer the download; I can make a CD or DVD, add video to it if I want. I buy CDs. Janis outlines good reasons above, but I would like to add that ear buds are scary. I like digital downloads. I have too many CDs already and I don't need any more junk in my house! As long as you avoid digital download that uses DRM (digital right management), you should be able to back up, and listen to your music from any device/platform and make CD from it. For example Amazon has mp3 download that's DRM-free, but beware of buying stuff from Microsoft zune, not all content are DRM-free. So just look for mp3 and DRM-free term when you buy digital music. I never understood why some folk would describe listening to vinyl as "more involving". Did the plops and crackles wake them up when they were about to fall asleep ? The best feature of the LPs was al that lovely space on the sleeves for the artwork ! I prefer CDs but,yes, the junk does build up.Yes, "Compression" detracts from downloads in many formats; and my CD playing set-up is far superior in sound to my computer. Janis makes a lot of sense and her use of metaphors and the English language is outstanding. I am a fan though I don't always agree. I prefer CDs because I enjoy reading about the composer, conductor and/or the musician. The cover usually contains a lot of interesting background information. An opera CD will often contain a plot summary and the libretto, sometimes even with English translation. Ear buds do kind of stink, but see if you can get the ones with a silicone seal around them. They're inexpensive and much better than open-air buds, especially on airplanes. I still remember bringing my ipod on a plane with me, listening to it during the flight, and then putting it on afterwards when I had landed and nearly blasting myself out of my chair. It was actually painfully loud, and to think, that's as loud as it was on the plane -- but that's how loud it had to be to overcome the ambient noise! Creeped me clean out that I had been blasting my eardrums that badly, so now I use the sealing ones and can listen to the ipod at a much more humane level on a flight. I just use really big, cushioned, Sony headphones with my little iPhone. Yes, it's a little funny that my headphones are three times the size as my device for using them, but the sound is wonderful and I believe it's not quite so bad on the ears as earbuds are. I also got these kinds of headphones for my kids, and they like them. I don't really have preference between CDs and downloads. They both have their positives and negatives. I have fond memories of vinyl, though. If you take care of them they don't crackle or pop, at least not until they start to wear out, which took a long time. And through a good sound system they sounded better than CDs and most downloads. And silly as it seems there was something about having the music on a record that made it seem more substantial. Some recording artists now put the liner notes for their CDs on the Internet. I think that's a great idea.